Rated 4 out of 5 stars.227 total votes. 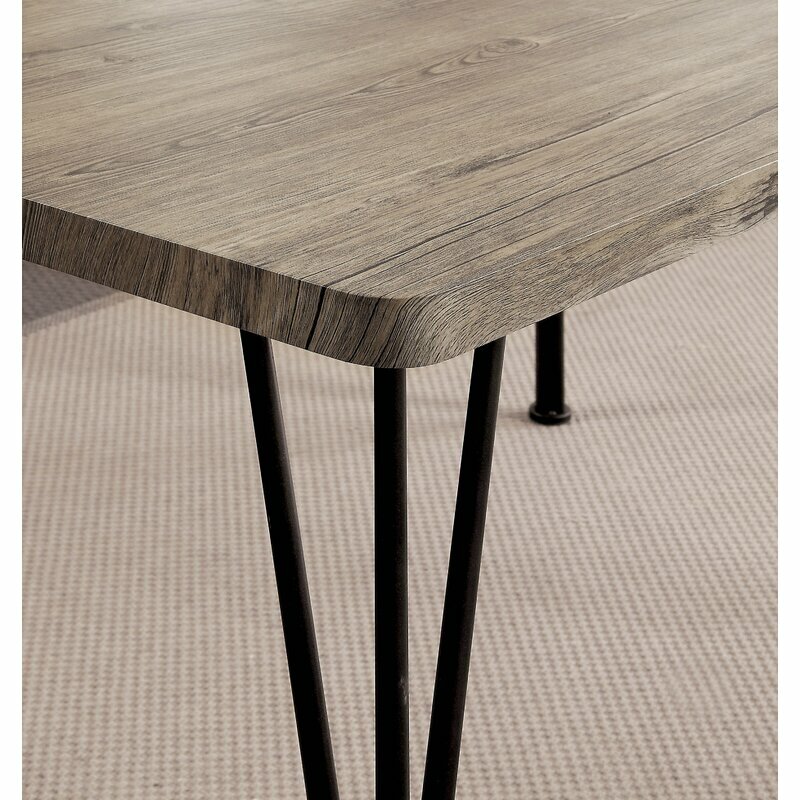 This dining set is ideal for both factory-chic lofts and modern farmhouses alike. Each side chair stands out with an openwork cross back and curved aprons. Full assembly for this product is required, so grab a friend to help! Weight Capacity: Table: 80 lb. Weight Capacity: Chair: 250 lb. Curate a unique and budget-friendly home with Andover Mills. Blending traditional appeal, bold patterns, and clean-lined silhouettes, we exist to complement your individual style. When you buy a Andover Mills Middleport 5 Piece Dining Set online from Wayfair, we make it as easy as possible for you to find out when your product will be delivered. Read customer reviews and common Questions and Answers for Andover Mills Part #: ANDV4536 on this page. If you have any questions about your purchase or any other product for sale, our customer service representatives are available to help. Whether you just want to buy a Andover Mills Middleport 5 Piece Dining Set or shop for your entire home, Wayfair has a zillion things home. Rated 4 out of 5 stars.228 total votes. "natural finished manufactured wood" is INCREDIBLY misleading. This is a cheap card table at BEST. We are beyond disappointed with this purchase. Despite the fact that we were lead to believe it would be wood (we accept that we did not do our due diligence and look at the materials), we were willing to look past it....BUT two of the chairs are so badly deformed, damaged or just plain old cheaply made that they screws don't at all line up with the legs and are completely unusable. It'll cost me more to return this 73 lb piece of garbage than I paid for it, but this poorly advertised and even more poorly built purchase will likely be my last on wayfair. This is a very cheap set; the finish is not at all wood, but MDF with linoleum overlays; the chairs are wooded seating but no wood back, and the table is very small for 4 chairs; quite disappointed...the photos deceived us, but we should have paid attention to the price; one does often get what one pays for in price level indeed. My country heart is full! This is an awesome, cost-efficient set for an apartment or even a small home. Yes, the table is faux wood but for a 5-piece set, you can’t beat the price! I wish I could give 4.5 stars because 34 chairs were uneven but nothing a few felt sliders couldn’t fix. They still seem very study. I am very pleased! Screws and parts seem to not fit at all! We had trouble trying to get the screws fit in the holes of the chairs. Table set up was fine but the chairs set up caused us issues. Looks great!! Easy to put together!! Very sturdy piece and easy to put together! Just the right size for our little family! Very cheap looking and top of table was slightly warped......returning it asap!!!! Overall good purchase. One thing though you have to swap the b and c screws or you will puncture holes while putting together the chairs! Rated 4 out of 5 stars.393 total votes. This dining set is the perfect addition for your cozy home, from quiet Sunday dinners with your loved one, or breakfast in space short on square footage. It arrives with two chairs, and one square table. The table base is constructed from metal with a manufactured wood top, and the chairs are crafted from metal and manufactured wood veneers. This five-piece dining set is the perfect addition for your home, from quiet Sunday dinners with the family to hosting dinner parties with friends. It includes four chairs, and one table. 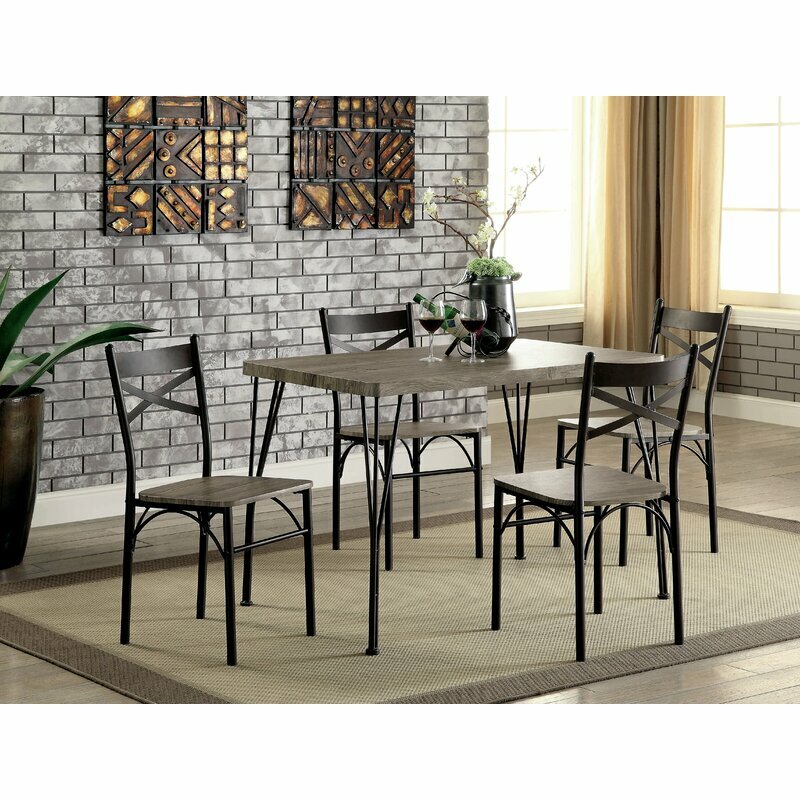 The rectangular table and chairs are constructed of iron in a black finish, with a ladder back design on the chairs, and are perfectly at home in a modern and contemporary aesthetic. The table measures 43.3'' L x 27.6'' W x 29.7'' H. Assembly is required upon arrival. Rated 4 out of 5 stars.15 total votes. This is a modern and beautiful Casiano 5 Piece Dining Set which is simple and elegant in appearance. This Casiano 5 Piece Dining Set is sturdy and stable enough to withstand years of use. Rated 4 out of 5 stars.194 total votes. Round out the breakfast nook or bring seating to a small-scale dining room with this five-piece set, including a table and four chairs. Rated 4 out of 5 stars.32 total votes. The desktop is made of tempered glass which ensures high-quality standards through multiple quality checks. Rated 4 out of 5 stars.178 total votes. Equally ideal for speedy meals before school and sit-down dinner parties with your foodie friends, this five-piece dining set is an essential anchor for your eat-in kitchen. Understated in design, it pairs black-finished metal frames with a manufactured wood top for a subtle touch of contrast. Each of the four side chairs lend comfort as well, with microfiber upholstery in a neutral gray hue to complement the openwork ladder backs. Rated 4 out of 5 stars.150 total votes. Rated 4 out of 5 stars.1126 total votes. This beautifully compacted five-piece dining set lets you seat up to four without sacrificing too much square footage. Made from tubular metal and vinyl, this budget-friendly set includes four cross-back dining chairs and one square table with rounded corners. Circular motifs on the chairs and along the sides of the table offer a decorative touch, while the faux wood-grain finish brings a hint of warmth. Once this set arrives, grab a friend for easier assembly and enjoy a meal in your updated abode. As you can clearly see the class of this dining set lies in its simplicity and is accompanied with the bold framework which will suit all types of houses gives and your enough room for all the dishes to be placed and is suitable to all homes. Perfectly proportioned for an eat-in kitchen or dining nook, this dinette set has an easy going casual contemporary appeal. Circular motifs on the chairs and along the side of the table offer visual interest. Rated 4 out of 5 stars.23 total votes. Perfect for smaller dining rooms and cozy eat-in kitchens, this five-piece dining set includes one rectangular table and four matching chairs to set a cohesive foundation in your space. Crafted with a metal frame in a matte black finish, each piece is adorned with a manufactured wood top or seat in a weathered brown stain for a rustic touch. This set’s clean lines and neutral tones give it a minimalist feel, making it right at home in modern farmhouse and industrial arrangements. Assembly is required.